When "Moderate" Fire Danger Turns "Extreme"
On June 24, 2009, we departed Moab, Utah, heading for Navajo National Monument, about 225 miles south. After viewing the Pueblo Verde Ranchettes, at Moab Ranch, we noticed smoke reaching skyward to our east. 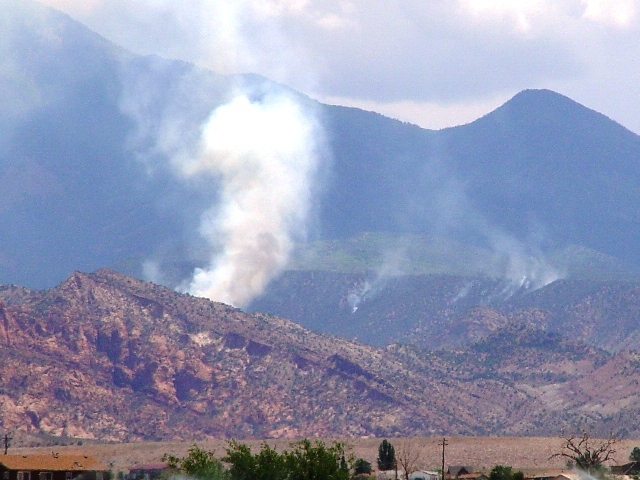 A fire of recent origin appeared to burn across a steep ridge, just below the slopes of the La Sal Mountains. We motored up Spanish Valley Drive to where it becomes Geyser Pass Road, in Northern San Juan County. Since we were towing a travel trailer, it did not seem prudent get any closer. Noting that it was 1:45 PM MDT, we snapped a few pictures from there, and then headed south on U.S. Highway 191, towards Monticello, Utah. During our brief viewing period, we saw neither aircraft nor ground crews heading towards the fire. Around us, everything was "busines as usual". To us it seemed that a fast-moving fire was not a problem to anyone in the area. When we wrote this article on July 7, 2009, we searched for any news regarding the fire, but no articles surfaced on the subject. Although we still do not know exactly what happened that day, here are the pictures to prove that it is a dry summer in Moab and Spanish Valley, Utah. As smoke continued to billow, we thought that perhaps it was time for local fire officials to change their signs from “moderate” to "extreme" fire danger.